Punjab Democratic Alliance(PDA) arrives at consensus on 9 Lok Sabha seats to provide a clean third alternative to the corrupt traditional parties. Capt. Amarinder Singh must immediately deposit crores of taxpayer money illegitimately used to further the political agenda of the Congress, in the garb of debt waiver function held at Moga today and presided over by Rahul Gandhi. 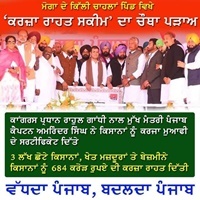 Misuse of public exchequer funds by Capt Amarinder Singh for political rally of Congress party at Moga in the garb of farmers debt waiver function. I request that the Congress party should bear the expenditure of the said rally. Punjab Democratic Alliance(PDA) arrives at consensus on 12 Lok Sabha seats to provide a clean third alternative to the corrupt traditional parties, CPI and RMPI Pasla group joins PDA.